In which I whine and complain about the renovation I whined for, of the kitchen I complained about. 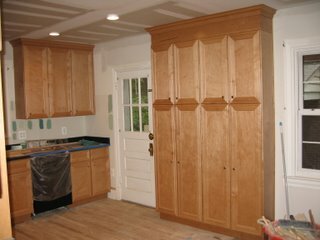 Edging was completed on most, if not all, of the cabinetry today. If you look closely, you'll also see knobs on the cabinet doors (which almost made me go for a "Bedknobs and Broomsticks" headline but I couldn't finagle it just right). The drawer pulls still need to be installed, but as far as cabinetry goes, we're almost there. This is the view from the front hall archway. 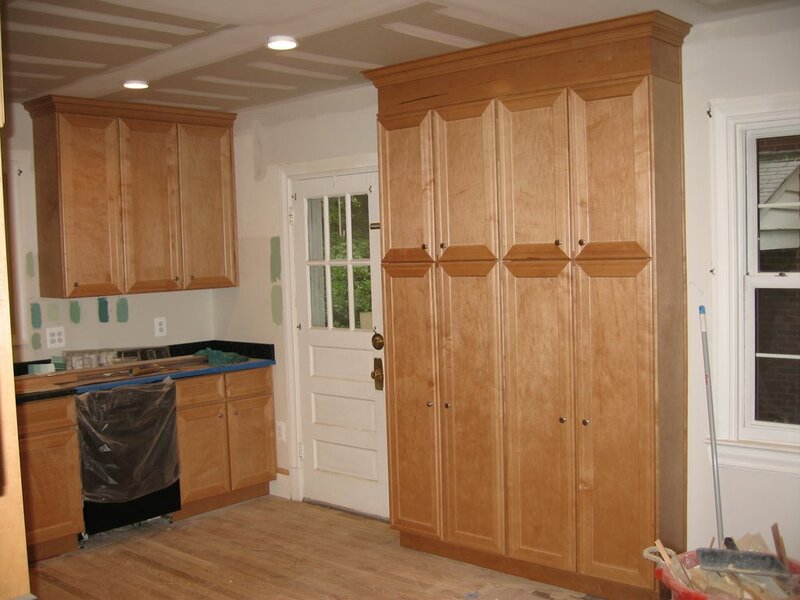 The big bank of cabinetry is our wardrobe/pantry area. Having a handy place for coats, bags, backpacks, etc., is going to be a huge change for us, and it's all the more necessary now that the practically useless hall closet is no more (sacrificed for the range area). There are hooks on the lower parts; I haven't decided what the upper part will house yet. Tomorrow we begin painting -- that is, the paint guy begins painting. As you may see from all the dabs of color, I'm having trouble deciding on color. At this point, we've narrowed it down to the two dabs to the left of the door. Input from friends has been exactly 50-50, which doesn't help at all. Our designer will be stopping by tomorrow to give her opinion, and then I'll just have to take a leap of faith and choose something. * Yes, I know the headline is too much of a stretch. Clearly, the paint problem is really getting to me. From this view, I like the upper dab. Does that help any? LOL, not that you asked for my advice....but if you really like color, the top would be pretty. But it may make the kitchen appear to be smaller. The second would be good if you wanted a little bit of color, and more toned down. And I would also go with the upper dab. It's much warmer.